It was a bright sunny day as I was cooking breakfast the crew that was building our garage was noticeably absent. I checked the thermometer and it registered 32 degrees below zero. If you are a carpenter that is an ideal temperature to call your boss and take a day off. If you are a skier it is a good day to hunker down and rest your sore muscles and tune up your skis. For the last three days the wind has been howling out of the west at about 30 mph and during lunch in the lodge someone asked me if it ever got that cold when I was living in the parking lot in our eight-foot, tear-drop trailer. Yes. It was a similarly bright sunny winter day, except without wind and about three and a half feet of snow had accumulated in the parking lot. Ward Baker and I had just finished cooking our bowls of oatmeal when we were politely asked to move our car and trailer so they could plow out our parking place. When we had arrived in Sun Valley we had only planned on staying for about a week and we had been burying our trash in the snow bank beside the trailer. There was no chance that our car would start without warming it up first so we got out our empty one-pound coffee can and filled it up with gasoline, lit it and shoved it under the engine. It contained just enough burning gasoline to warm up the oil in the engine but not big enough flames to catch the engine on fire. As the flames went out Ward stepped on the starter and the engine came to life. Well, it coughed and wheezed a little bit and then struggled to barely run. Finally we were able to tow the trailer out from its own snow bank and the rotary snowplow could then carve a clean path through our part of the parking lot. We forgot about the trash that we had been burying in the snow bank behind our kitchen for the last three weeks. The giant rotary plowed through that trash and it landed in the trees above where we had been parking. Now hanging from the trees were milk cartons, polka dot Wonder Bread wrappers, old cans of corned beef hash and the carcasses of five rabbits we had shot in Shoshone on the way to Sun Valley. From that moment forward for the rest of the winter it was easy to tell people that we were living under the tree with the milk cartons, pink napkins and bread wrappers. But I have diverted from my temperature discussion. That winter we had no quilted parkas; they had not yet been invented. No one knew anything about layering and our soft leather boots were just that. The important thing for me in retrospect is that I didn’t know that I was supposed to be cold. It was a question of skiing every day all winter. And that was the answer, too. We never had frostbite and we never complained about the cold because there was no one to complain to. We did learn to wear long underwear with a sweater over it, then a nylon windbreaker and then another sweater. The second sweater kept the nylon parka close to the first sweater and somehow it worked. You could always go into the Round House and warm up. You had to be careful, however, if you got too close to the fireplace because you might spend the entire day by the fireplace. I thought it was kind of dumb to ride clear up to Sun Valley from Los Angeles on the train and spend the day by the fireplace. It really was great in Sun Valley then because the chairlift only hauled 426 people an hour and you could ski in untracked powder snow from one storm to the next whether you were cold. As far as I can remember, I was never cold, chilly perhaps, but never cold. But my wife says I lie a lot. We’ve received a few comments in recent months from readers nostalgic for the simple things in life, namely, lightweight low tech caravans. For some, the increasingly sophisticated technology and heavyweight designs of modern tourers aren’t cause for celebration. Well Beryl, in response to your cries of lament here are our top five tourers that can be towed by a reasonably sized VW Golf. 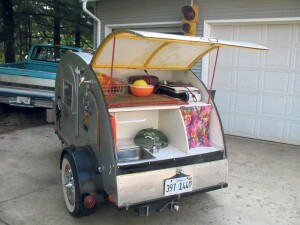 These teardrop shaped trailers are based on the travel trailer design which originated in the US. Their diminutive form is light enough to be hauled behind a quad bike. But caravanners beware, you will have to travel light as nominal storage comes in the form of a small roof mounted cupboard above the bed. A winner in this years’ European Caravanning and Design Awards, the Tuareg is lightweight and garage friendly with an elevating roof for extra headroom. 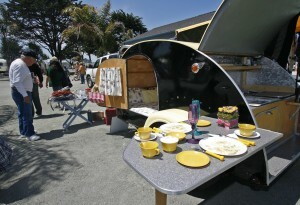 The cunning island kitchen design can be used in the cabin or taken outside for the chef to prepare dinner al fresco. 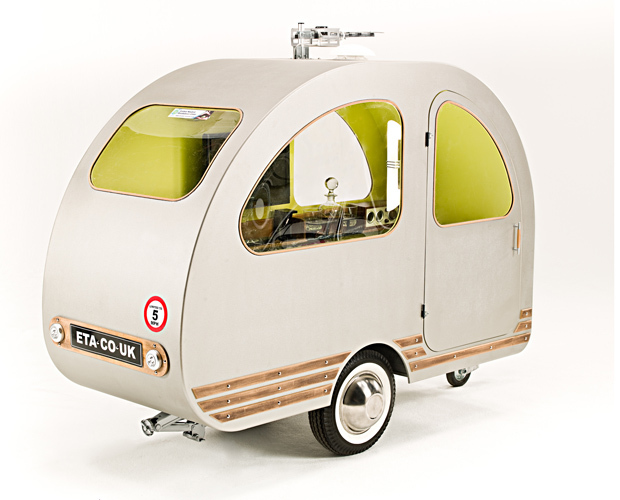 Manufactured at the Tabbart factory near Frankfurt in Germany, these pint-sized caravans come in a range of three layouts – the smallest of which is the T@b 320. 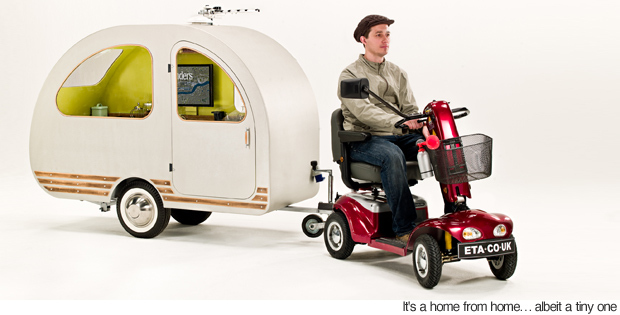 In its naked form weighs approximately 550kg and is small enough to be towed by a mini. If you’re looking for something a bit more mainstream, have a look at the Finesse 2. 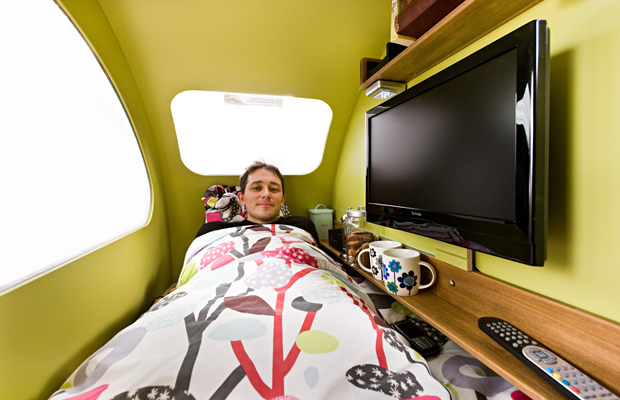 This compact lightweight tourer from Swift Caravans is the littlest in the Sprite range. Standing at 3.66m in length with an MTPLM of 1,084kg – it is small enough to be matched with a small family car such as VW Golf or Vauxhall Corsa. And finally, we come to our final European offering, the Action 361 from Adria Caravans. Slightly undercutting the Sprite in cost and weight it comes equipped with a large toilet and boasts class leading storage facilities. If you have ever been seduced by the siren call of the road, this weekend you’ll get a chance to see how the early nomads of the highways found comfort as they traveled. Some 35 old-school trailers will be setting up an overnight camp in the Juror’s parking lot at Auburn Folsom Rd. and Lincoln Way for Old Town Auburn’s Vintage Trailer Classic. This free event will be open on Saturday from 3 to 7 p.m. and Sunday from 10 a.m. to 3 p.m., and all trailers will be open for viewing. The show is sponsored by the Old Town Business Association and Carpe Vino, and will include more than a dozen Airstream trailers, the iconic “silver bullet” rigs that first appeared on American highways in the 1930s. Other fully restored trailers include brands such as Shasta, Boles Aero, Silver Streak, Argosy, Streamline, Airfloat and many more. The oldest trailer on display is a 1937 Gypsy Caravan Teardrop, a compact little unit with just enough room to sleep two adults, with a pop-up kitchen unit. 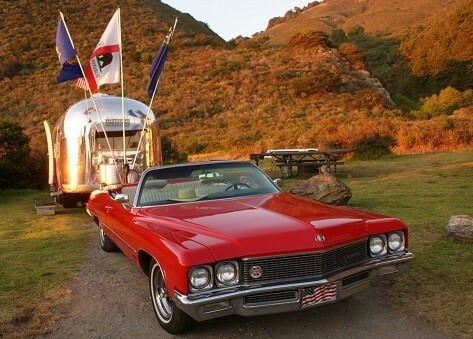 In contrast, a 2010 American Teardrop from American River Sales in Auburn will set up. For more information, go to www.vintagehighway.com. By Gloria Young, Auburn Journal. The economy has influenced all facets of daily life and occasionally in a good way. 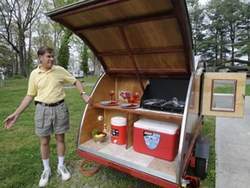 Teardrop trailers, around since the 1930s, are seeing a boom in popularity. In Auburn, American River Sales has sold American Teardrops for 10 years and recently began manufacturing them in response to increased demand, according to general manager Bud Hausman. “We can’t build them fast enough,” he said. 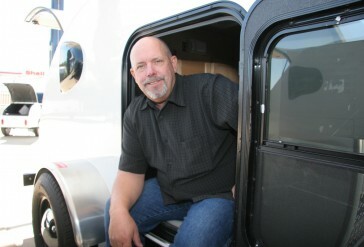 The trailers have been increasing in popularity for the last 15 years, “with the last two years seeing the biggest growth we’ve ever seen,” he said. The demographic is just about everyone who enjoys the outdoors. Teardrops offer a no-to-low frills experience. The original teardrop design appeared in the 1930s. Then in 1944, Popular Mechanics ran an article on how to build one at home, according to Hausman. 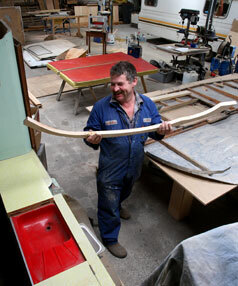 “The unit we build is a pretty close replica of those 1940s units, using modern-day materials,” he said. The average size of the trailer is 5 feet by 8 feet. There are windows on both sides and a door on one side. American River’s basic models range from $3,995 to $5,995. You get the base model and then you outfit it the way you want. 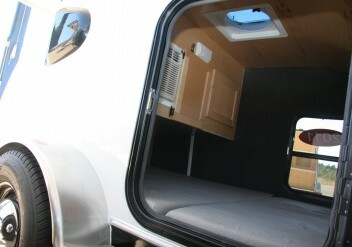 Among the options are air conditioning, pullout kitchen and mattresses. “If you added every option, the unit would still be about $8,000,” Hausman said. The Auburn store geared up its manufacturing site earlier this summer. Prior to that, the teardrops were all made at American Teardrop headquarters in Elkhart, Ind. “This past year, we decided to open a factory here to cut down shipping costs,” Hausman said. On Nov. 1, the factory is moving to a new, larger location at the corner of Borland Avenue and Lincoln Way. Hausman said he expects to add another six to 10 jobs to the already six jobs created when the plant is fully up and running. 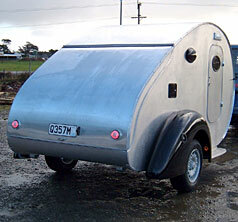 American Teardrop is only one of numerous brands that make the teardrop trailer. But most are custom-design manufacturers that turn out a few units a year and charge much more for their product, Hausman explained. “It’s becoming so popular that big companies are coming out with mini-models to compete with teardrops because they know that’s where the market is growing,” he said. American River Sales will have one of its teardrop trailers at this weekend’s Vintage Trailer Classic show in Old Town Auburn. Gary Moffat, owner of Carpe Vino and organizer of the show, will have a 1937 model on display along with American River’s new model. 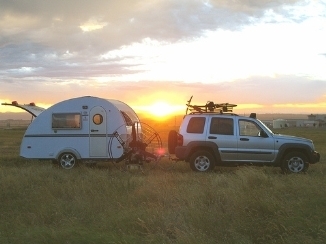 Moffat has become a vintage trailer enthusiast after purchasing a 1972 Airstream Globe Trotter a year ago. He took his idea for the show to the Old Town Business Association, which signed on as a sponsor. Moffat got acquainted with American River Sales as he was coordinating the show.